Trupanion was originally founded by Darryl Rawlings in 1999 as “Vetinsurance” in in Canada. 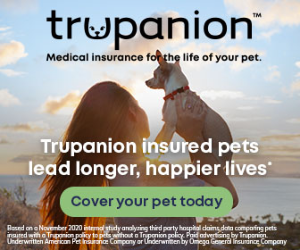 In 2005, Trupanion expanded into the United States and became the first North American pet insurance provider to become licensed to provide its own underwriting, the American Pet Insurance Company (APIC). Trupanion is a founding member of the North American Pet Health Insurance Association (NAPHIA), which educates pet owners in North America about the veterinary industry. 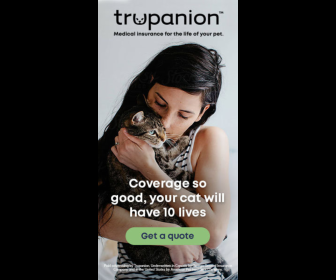 The Seattle Times named Trupanion the company with the “most unusal perk” for offering employees the option of insuring their dog or cat with a “0” deductible. Trupanion is the only publicly traded pet insurance company. Trupanion trades on the Nasdaq exchange under the ticker symbol TRUP. Enrollment Requirements No vet exam is required to enroll, but exam required for claim payout, and yearly exam for future claim payout. Flexible deductible options from 0 to 1000. Offers 24/7 customer service, email and phone call. Wirecutter, A New York Times Company, rates Trupanion best pet insurance, number 1 pick. Trupanion is the only publicly traded pet insurance company. Trupanion has been around for a long time. Many veterinary clinics recognize Trupanion and promote Trupanion because they are one of the few companies that offer direct vet pay. With veterinary care being costly, and the Trupanion policy owner can have the option to walk out of the vet clinic with just paying 10 percent of the veterinary bill and any deductible amount if not yet met, is a great benefit. This would ease the burden for the pet owner to come up with a big portion of the bill. Furthermore, Trupanion’s customer service is available 24/7, and preapprovals for treatments, including emergencies can be approved within 24/7. Finally, Trupanion is one of few pet insurance companies that cover supplements like Dasuquin, and the only pet insurance company that offer a “O” deductible. Although Trupanion may not cover the vet exam fees, may not offer a convenient phone app, and the monthly rates are higher than most of their competitors, Trupanion offers the convenience of direct vet pay and 24/7 customer service and pre-approvals, which the pet owner may need more during unexpected times. Finally, two members of our team tested Trupanion’s customer service, and contacted customer service at different times. The customer reps were friendly and knowledgeable, and each time a friendly rep answered, there was never a long wait hold. So if you are looking for unlimited payout coverage, with a simple 90 percent coverage plan, and want the option for the insurer to pay 90 percent of your vet bill (minus any deductible if not yet met) directly to your veterinarian at checkout, click on Get My Quote from the Trupanion banner link above, and check if Trupanion’s plans and prices will work for you and your pet.